Nature Deficit Disorder (NDD) is concept created by Richard Louv to describe how children are experiencing a number of negative health and social problems because they are not spending enough time in the natural world. Root causes include kid spending more time playing playing computer games and watching tv (the average American child spend 44 hours a week playing on electronic equipment) indoors, loss of neighbourhood parks and nature areas, and parental fears of keeping kids indoors because of the largely media fuelled ‘stranger danger' world out there. The effect of NDD seems to correlate strongly with the mental and physical health of kids. Obesity has doubled in the last 10 years amongst 2-10 year olds - 28% of girls and 22% of boys in this age group are now classified as overweight or obese. Depression is also affecting more than 10% of 11-17 year olds. What's more kids apparently know less than their parents about the natural world at their age. In a 2008 BBC Wildlife survey 38% of 9-11 year olds could not identify a frog. It's also believed that those kids not getting enough time exploring in the great outdoors is they lose respect for nature. If we're pouring in to our kids minds facts about climate change and the world's depleting raw materials we must correlate that will some hard evidence - educate through experience - natural, unbounded, exploration of the gardens, parks and forests if we are expect them to grow well-grounded not rounded. And here are the good stats. 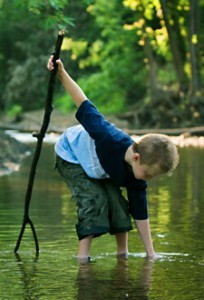 There's a 300% reduction in ADHD symptoms in those kids who play in nature rather than indoors. Research has also shown there's a 50% reduction in vandalism and domestic violence in families that live in tower blocks which have views of greenery compared to those who don't. If you fancy taking the kids to visit an organic farm visit the Soil Association website to see if there's one close to you. Walk in the wilderness kids?